Here’s how it went down. 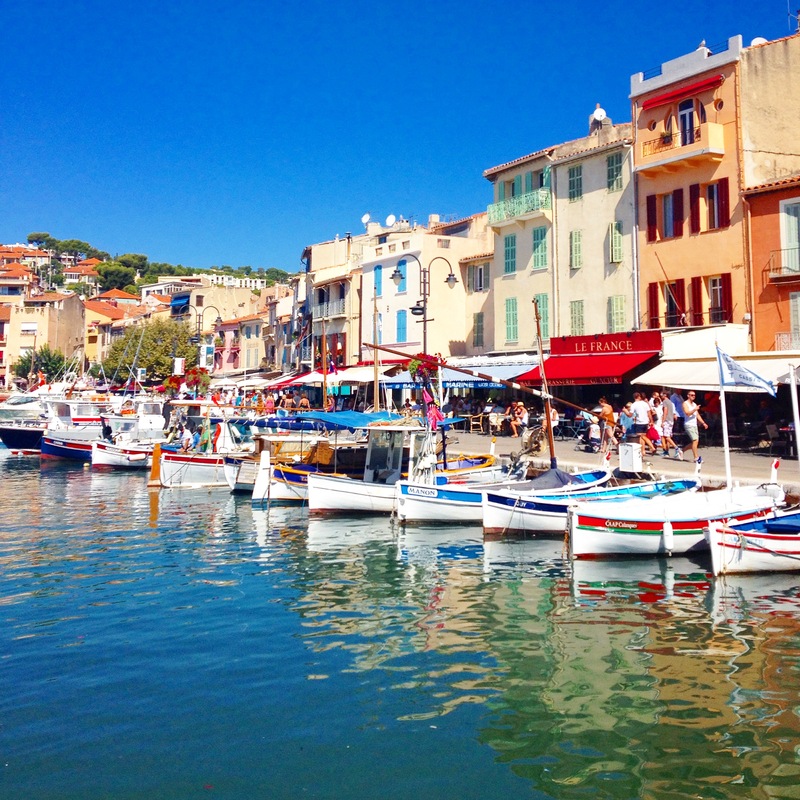 I took a covoit (a rideshare via covoiturage.fr) from Marseille to Cassis for two euros and arrived at the charming port about 9am. It was already warm. This boat is named “Teddy Bear” and I found that amusing. What to do, what to do? 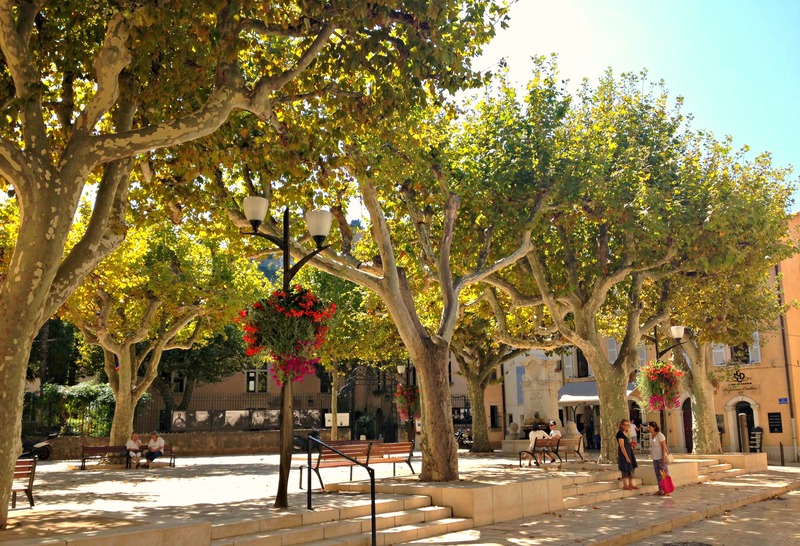 I knew that I wanted to see the famous Calanques, lie on the beach, and wander the town. I picked up a map at the tourist office (between the boats and the beach) and meandered along the port. Some people say it’s better to hike the Calanques, and some people recommend a boat tour. I didn’t have the choice: trails were closed due to high winds, and apparently sandals are not appropriate hiking shoes anyway. But 16€ for the boat ride was a stretch on my ever-thrifty budget. Hmm. Conundrum. By the time I got back from my Calanques adventure, it was almost lunchtime. So I walked away from the port into the town to scavenge. 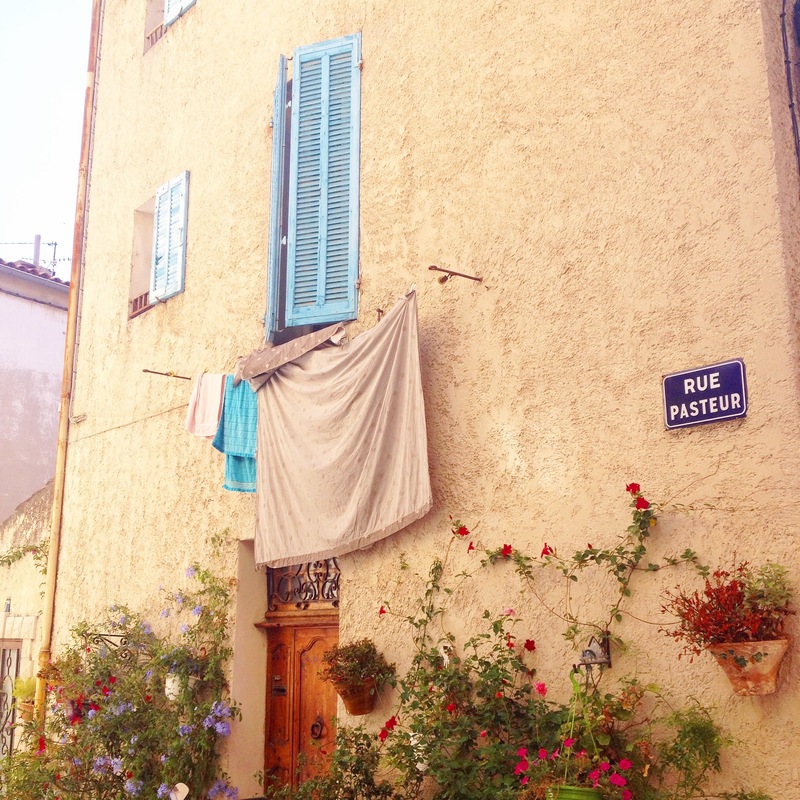 I think one reason that I didn’t love Cassis as much as I expected to is that it’s pretty touristy. It’s affordable but not cheap. Maybe I needed a local to show me where to eat. 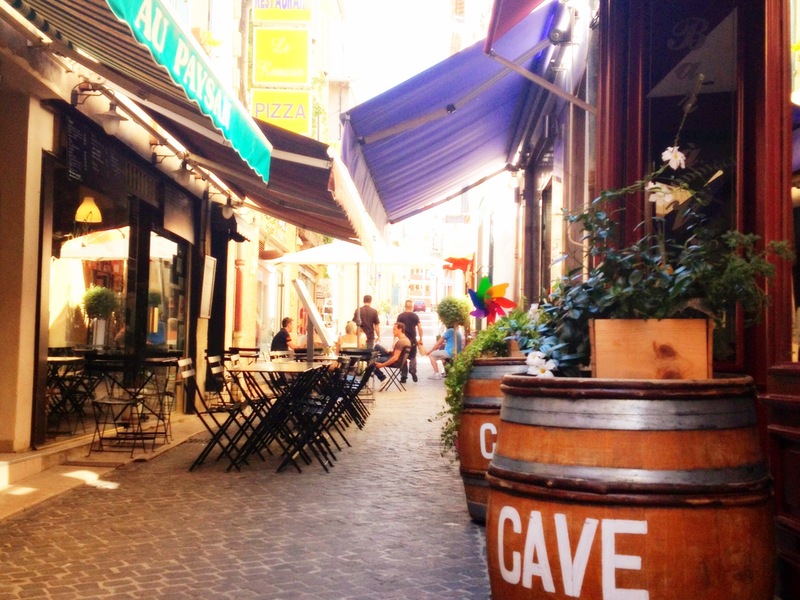 I ended up having a leisurely lunch in this little alleyway. I splurged on the lunch formule (YES, I consider 16€ for lunch a splurge, I’m a @#$%^& English teacher in France!!) and enjoyed my lunch, dessert, and rosé in the afternoon warmth outside. After lunch, I strolled through the charming narrow street for awhile. Around 2, it was time for the beach! Can you imagine what it’s like in July? I found a spot amongst the mostly-elderly beach-goers, plunked myself down on the pebbly sand near the water, and took feet-selfies because I didn’t want to take actual selfies. Here’s the problem with going to beach alone. One, it’s kind of boring, and two, there’s no one to watch your stuff if you want to go in the water so you have to awkwardly back in while eyeing your possessions (or balance them atop your head, but I’m not that talented). Luckily, I hate putting my head underwater, so I am happy to wade in up to my waist, splash around while surveying my purse, and pop back to shore forty seconds later. My mother told me never to turn my back to the ocean, but that was the Pacific where there are actually waves. Do I risk getting hauled out to sea by the Mediterranean undertow? I had to catch the bus back to Marseille at 4 p.m. It’s only a couple euros, but it doesn’t run too frequently, and apparently the train station of Cassis is not within walking distance. I was so tired after my day of relaxing in the sun that I fell asleep on the bus. Later, I got trapped on the train to Toulon, but that’s another story. Cassis, I don’t know if I’ll be back. But it sure was nice to meet you once. 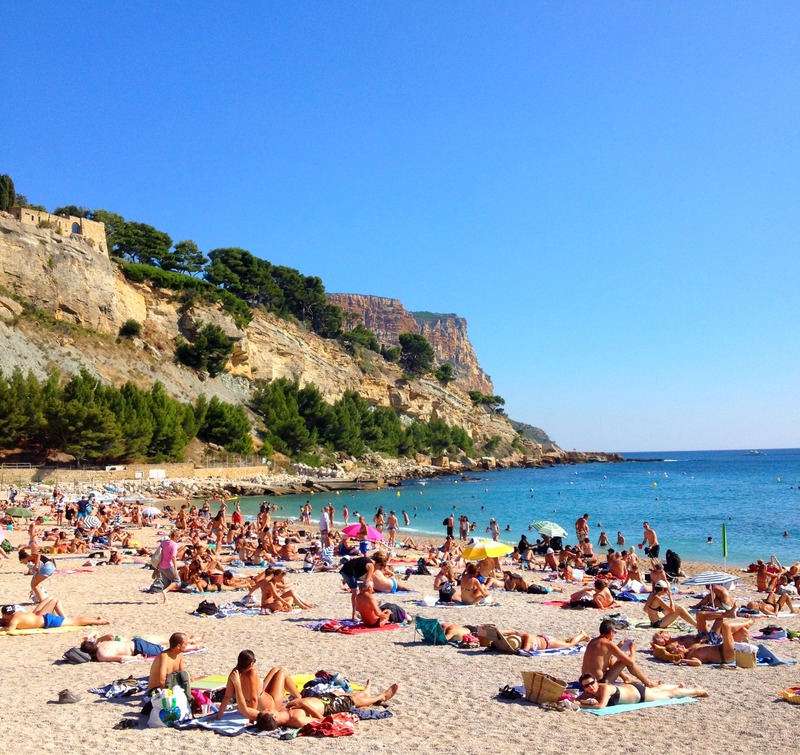 I was just in Cassis for a day this summer, and you’re right, it was packed. I didn’t go to the beach but I WAS able to hike the Calanques, and it was an incredible experience. Your photos are so beautiful, thanks for sharing this! Thank you! How cool that you got to visit the Calanques! Did you write about it? Please post a link if you did! I am from near the Atlantic Ocean, and I totally relate to how different an experience the Mediterranean is! It’s like I keep waiting for those waves to hit me, but it’s just so tranquil. Lovely. 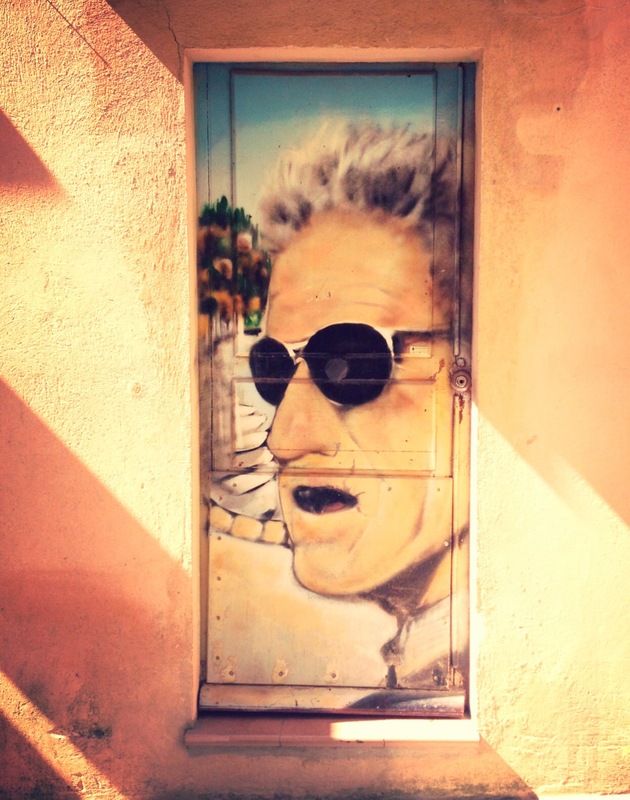 it’s always fun to explore somewhere a bit different, even if it’s not mind blowing – it’s your own little adventure! 🙂 love it, and love anywhere in france haha. 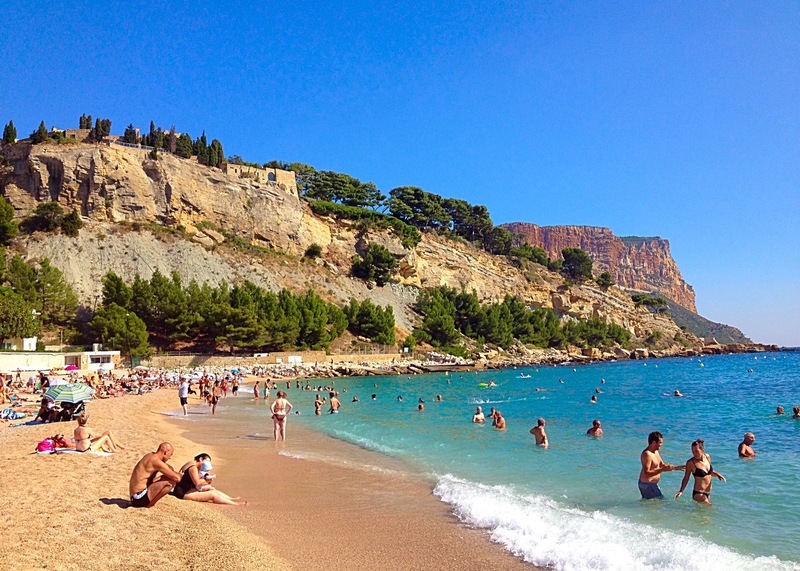 I’m dying to go to Cassis, tried to go in April when we took a trip over to the Riviera, but didn’t quite make it. It was great to read your lovely take on it! I’d still like to go – but never in summer, like you I’m not too keen on the South of France crowds. Really pleased to come across your blog and I’m looking forward to reading more! Thank you! I’m happy to have found yours as well 🙂 I haven’t been to Toulouse in years but I remember that it was a beautiful city!